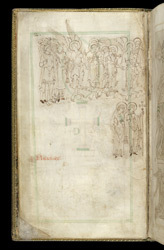 This page is the left half of a large picture spreading across two pages and showing the faithful being admitted to heaven while the damned are pushed into Hell's mouth. This page has a queue of male figures--monks, priests, martyrs (identifiable by their palm leaves) and early Christian disciples--ushered by two angels before the gate of heaven. Below the queue two churchmen, both tonsured as monks and wearing clerical vestments, gaze with enjoyment at the vision on the adjoining page. The name Aelgarus, written to their left, perhaps refers to Aelfgar or Aethelgar, Abbot of New Minster (965), Bishop of Selsey (980) and Archbishop of Canterbury (988).